With Hurricanes Irma and Harvey in the southern states, record-breaking flooding in Ontario and a devastating wildfire season in BC, it has been a harrowing summer for many individuals and businesses in Canada and the U.S.
Every year, natural disasters are setting new records for their frequency, severity and cost to individuals, businesses and governments. But the numbers are particularly dire for businesses. When disaster strikes, it is estimated that 40% of businesses never recover. That is why it is so important for businesses to be prepared. While we can’t predict when disasters will strike, or where, every business can take steps to ensure they will be able to recover as quickly as possible if the worst happens. We’ve written about emergency preparedness before but there is always more that can be said. This time, we spoke to two emergency management experts to compile a list of resources that are available to Canadian businesses to help with their emergency planning. Stroup has been working extensively with Port Coquitlam’s business community over the past few years to ensure that they are prepared in the event of an emergency. That work has included a survey, a letter of understanding that gives Stroup an idea of resources that businesses are willing to offer in case of an emergency, and a series of workshops aimed at ensuring that businesses have all the resources that they need to create and implement a business continuity plan. The workshops have included presenters such as CP Rail (”They’re masters at safety,” says Stroup. “We brought them in as a case study.”), a local business owner who lost everything in a fire, and the Insurance Bureau of Canada. 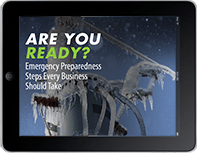 On top of making contact, many municipalities offer emergency preparedness templates and other resources for businesses on their websites. Port Coquitlam’s next emergency preparedness workshop for businesses is on November 15 at the Poco Inn and Suites. Contact Tara Stroup at the City of Port Coquitlam for details. On top of web resources, provincial governments also offer disaster relief to individuals and businesses that have been impacted by events such as natural disasters. But accessing that money can be a challenge. “Federally and provincially, they have to say it’s an event worthy of assistance,” says Sanderson, “And then people have to apply.” “It’s not the same as having insurance,” she explains, emphasizing the importance of being as prepared as possible. For insurance guidance, both Sanderson and Stroup recommend contacting the Insurance Bureau of Canada. “Because they’re not selling anything, per se, they’re a really good resource in terms of identifying what you need for insurance,” says Sanderson. This BC government has created a website to offer valuable information about surviving the zombie apocalypse. To find out how to prepare for this inevitability, click here. Creating a thorough and workable business continuity plan can be a daunting task for businesses of any size. If your municipality doesn’t have the same level of support offered by Stroup and Sanderson, fortunately there are businesses that specialize in emergency preparedness. If your company has the resources to bring in a consultant, there are plenty of options. The EPICC website (Emergency Preparedness for Industry and Commerce Council) lists members, many of whom are able to offer expert assistance. Other region-specific organizations, like BCAEM, also list emergency preparedness service providers on their websites. With emergency events on the rise, Sanderson is optimistic about the resources available to businesses. “There are more and more resources that are developing,” she says, because business continuity is important not only for the businesses themselves, but also for the health of the community as a whole.